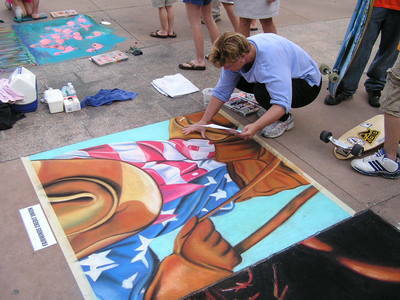 History of Chalk Art / Street Painting in the State of Florida, USA. Mayor Hood approved the venue around the Orlando City Hall with proceeds from the event to benefit the Youth Athletic Program. Plans included obtaining Square Sponsors, recruiting local artists, and fund-raising activities. Lee Jones, daughter of Ed Baranowski, was the first artist recruited. She grumbled “chalk art was my worst subject in art school.” Her father prevailed. Lee practiced on her driveway. 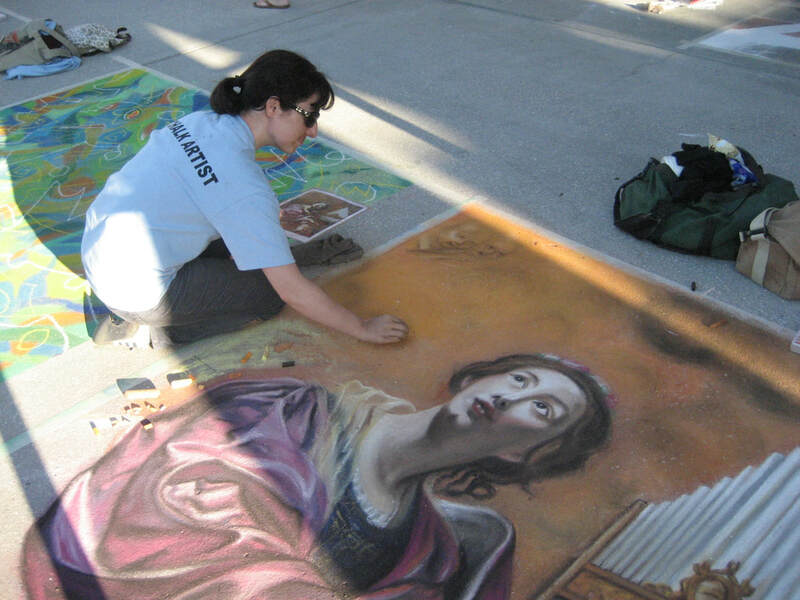 Since there were no other street painting events, the “annual” Rotary Fest left artists looking for more opportunities. The Suntree Rotary Club in Melbourne Florida hosted an event March 9, 2002 at the Holy Trinity Academy. Lee Jones and Ed Baranowski were award winners. Interest in street painting was growing. 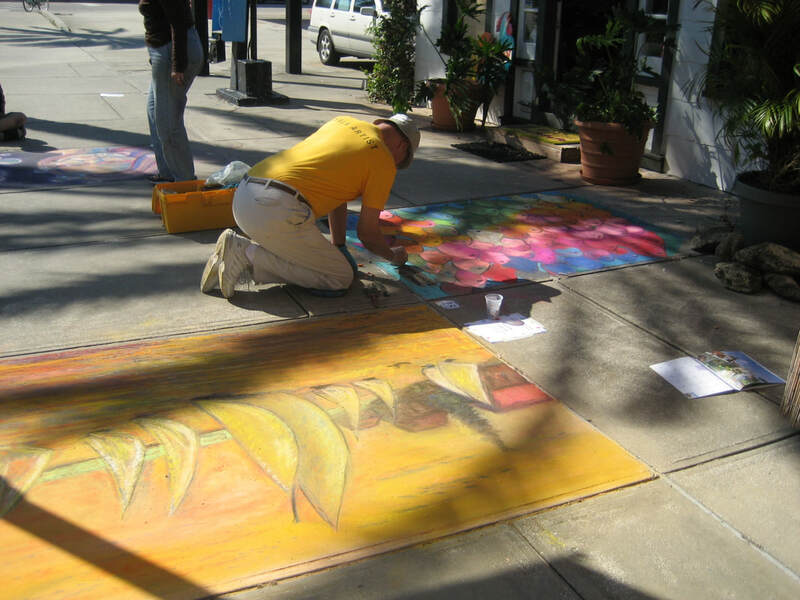 Novice chalk artists wanted more. 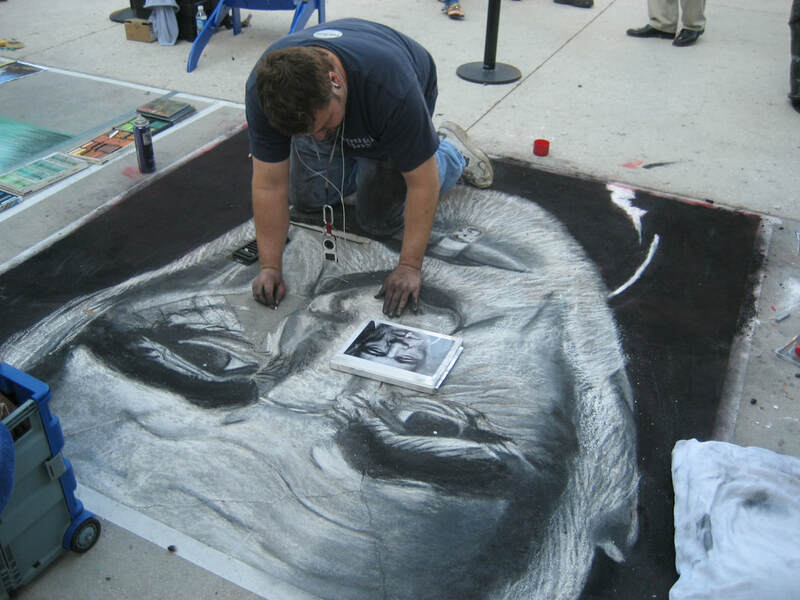 Ed Baranowski drafted bylaws for the Central Florida Chalk Artists Association (CFCAA). An organizational meeting was held on November 10, 2002 in conjunction with the 27th Disney Festival of the Masters Arts event. The 23 founding members adopted the bylaws and elected officers. Ed Baranowski was elected the first President and Lee Jones was elected Vice President (President in 2006). Other venues became available throughout Florida. The Disney Festival of the Masters provided valued financial resources for the organization. Local art teachers (Robert T. Earl Jr., Felipe Morales, and Judi Tome among others) prepared their students. Disney hosted a super event and provided chalk, refreshments and prize money. The last event was in 2013. Disney remodeled and renovated the Disney Downtown venue ( now Disney Springs ) resulting in heavily textured sidewalks. Street painting could not happen on the new turf. At the annual meeting on November 11, 2007, the members voted to change the name to Florida Chalk Artists Association (FCAA). Some members wanted “Street Painters” instead of “chalk.” There was even talk of forming a National and International association, but the group agreed to stick with Florida. Eventually, the need for a International Street Painting Society (ISPS) was formed by Jennifer Chaparrio one of the FCAA memebers. FCAA adopted a professional designation program in 2007 that provided Simplici, Qualificato, and Maestre recognition. The Florida plan was patterned after the Italian model. Procedures, forms, logs, and jury direction were developed.